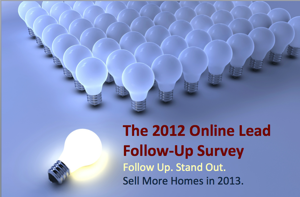 Mike Lyon of DoYouConvert.com and LassoCRM.com have teamed up to present home builders with The 2012 Online Lead Follow-Up Survey, which reveals some surprising follow-up statistics. Including the fact that out of 200 new home communities contacted via website registration form, a whopping 30% did not respond via email or phone call! The paper also highlights why builders have such a distinct opportunity to stand apart from the crowd in 2013. To learn about the five core elements to convert more online leads to appointments, and why an Online Sales Counselor may be your single most important marketing investment this year, download the full white paper here.